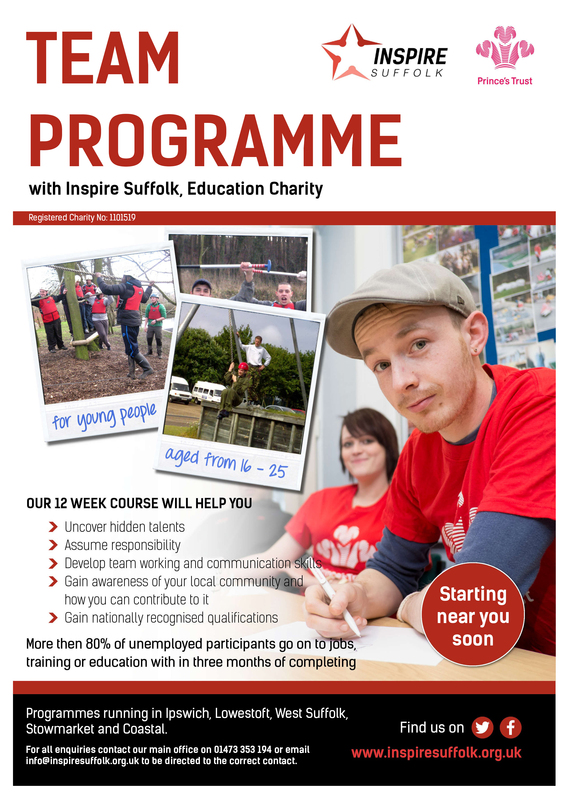 Inspire Suffolk is a registered charity (1101519) working with young people in Suffolk to inspire, motivate and educate those in need, especially those who are harder to reach. Thousands of people across Suffolk have benefited from our work in communities across Suffolk of all ages, abilities, communities and backgrounds. We work hard to provide young people with the opportunity to take part in activities that perhaps they may not otherwise have access to, which include education, health and sport programmes. Prince's Trust Team Programme in locations including Ipswich, Lowestoft, Coastal, Haverhill, Colchester & Stowmarket. Run in partnership with The Prince's Trust working with 16-25 year olds across Suffolk who are not in employment education or training. National Citizen Service (NCS) in Spring, Summer and Autumn working with 15-17 year olds. Sports Coaching Apprenticeships for 16-19 year olds. PE in Suffolk School including PPA Cover and After School Clubs - schools can choose a variety of different packages to suit their needs. We have sports sessions for people with disabilities, and a range of other physical activity sessions open to all ages and ability levels.